Tottenham are reportedly considering a transfer swoop for West Ham striker Andy Carroll, valued at just £2million as he nears the end of his contract. The Hammers ace has had his difficulties with fitness in recent times, and isn’t exactly in the best form right now, with no goals in the Premier League this season. Still, the Sun claim Tottenham are interested in the £2m man as Mauricio Pochettino could probably do with another option after Harry Kane’s recent injury and Fernando Llorente’s poor performance against Fulham. The Spaniard scored an own goal to put Spurs behind in that game, though they eventually turned it around at Craven Cottage to come away with a 2-1 victory. 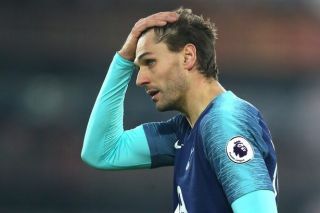 Llorente, however, does not look good enough to fill in for Kane for any sustained period, and while Carroll isn’t exactly the most inspiring option either, Spurs fans would probably take any signing right now. The Sun also link the north London side with some interest in Bournemouth front-man Callum Wilson, though they suggest he’d likely be too expensive at £40m.